When you’re building a product, one of the hardest things to figure out is how to drive organic growth every week. In the early days of KISSinsights (now Qualaroo), my on-site survey tool, we were able to drie 3x growth by doing one small thing—and it wasn’t rocket science. We simply added a “powered-by” logo to our product. 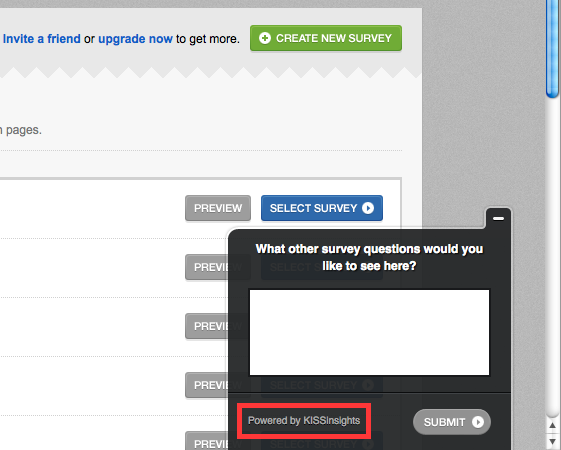 The more customers installed the survey on their sites, the more our product got in front of new, potential customers. When the use of a product can also work as advertising for that product, it’s much easier to achieve viral growth. But that’s not always possible. Today in SaaS, more and more people are building businesses with “invisible” products. These can be developer tools like Docker, infrastructure-as-a-service like Stripe, and API-first companies like Twilio. Invisible products often require code to get up and running. They can be pretty technical and they don’t always have a customer-facing web app. To drive growth, they have to figure out how to make the invisible visible. In this article, we’ll walk through examples of how companies have used each strategy to make invisible products visible. Then, we’ll share some tactics to show you how you can do the same. When you’ve built a product on top of an API, your product might have a lot of value and a bunch of different use cases. But that doesn’t help if people don’t know about it. What’s more important than explaining product features is showing people what they can accomplish with the product. Zapier is a perfect example of this. It’s is a web-based service that allows customers to integrate all the different tools they use. 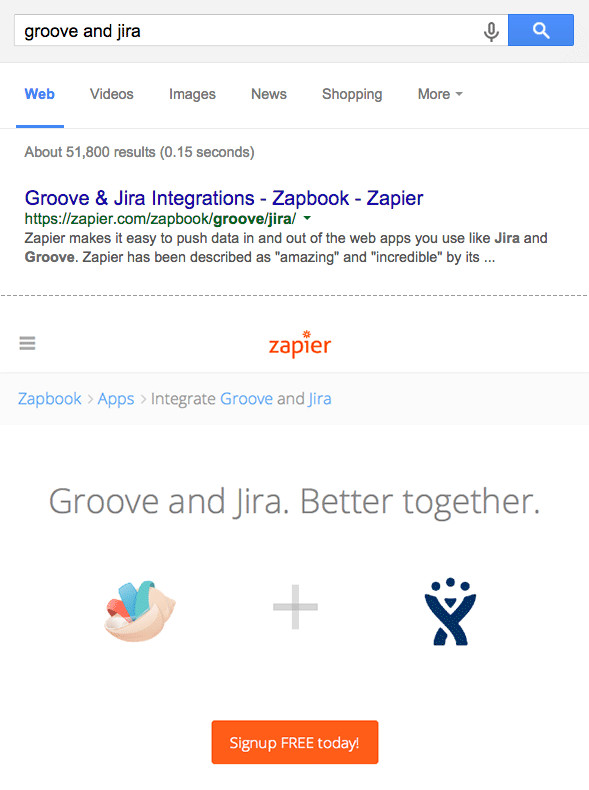 Rather than try to explain the value of integrating tools, Zapier simply piggybacked off all the tools potential customers used and already found valuable. In the early days of Zapier, CEO Wade Foster searched product support forums, looking for users who wanted integrations. He’d post comments to those forums explaining how to integrate apps if they could write code—and if they couldn’t, linked them to Zapier’s home page. To scale this outreach, Zapier turned Wade’s early forum posts into blog posts and guides on Zapier’s website. They used content marketing as a vehicle to give value to potential users based on the tangible things that Zapier could help them do. The topics were specific things that their audience would be interested in, like productivity, workflows, and apps. They invested a lot of time and effort into building this blog, but the team takes the stance that if you keep delivering great content consistently, the rewards will compound. Sure enough, the payoff has been huge. Their content strategy helped them cast a wide net around all the tools that people already used—tools that could be integrated with Zapier. Today, Zapier has over 250,000 monthly blog readers, and 600,000 users. This directly targets users who want a solution to make these apps work together. It puts a real use case in front of them at a critical moment so they don’t have to imagine how useful the product can be—it’s easy to see right away. Do the research on all possible use cases. Zapier wasn’t satisfied by building out one or two landing pages to show how apps could connect. They literally built one for every product combination they could think of to get their product in front of more eyes and help as many people as possible. When you think you’ve come up with an exhaustive list, go back and look for more. Shadow your early customers, scour the forums, be open to a few surprises along the way. Content can work as a viral loop. Quality content takes time and effort. It’s harder than slapping a “powered-by” logo on your product, but it’s ultimately much more helpful and will drive bigger long-term returns. As your blog grows, so will your search traffic. It’s a self-perpetuating marketing channel, driving more people into your funnel with less effort as time goes on. Zapier saw there was a huge desire for a good integration product in the market and then developed a content strategy around their core value—integrating tools that people already used. Then they went out and put the potential use cases right in front of their customers. An API-first product often requires that a developer install it—but the end user isn’t necessarily a developer. The trick is to get the product in front of your target audience without confusing them with a bunch of code. Clearbit has done this by creating free products and tools for its core audience. Clearbit provides APIs that help salespeople and marketers enrich their leads. Throw up an email collection form on your website, and Clearbit will enrich each email with a first name, last name, and company name. By making free tools for salespeople and marketers, they’re able to get in front of their target audience. 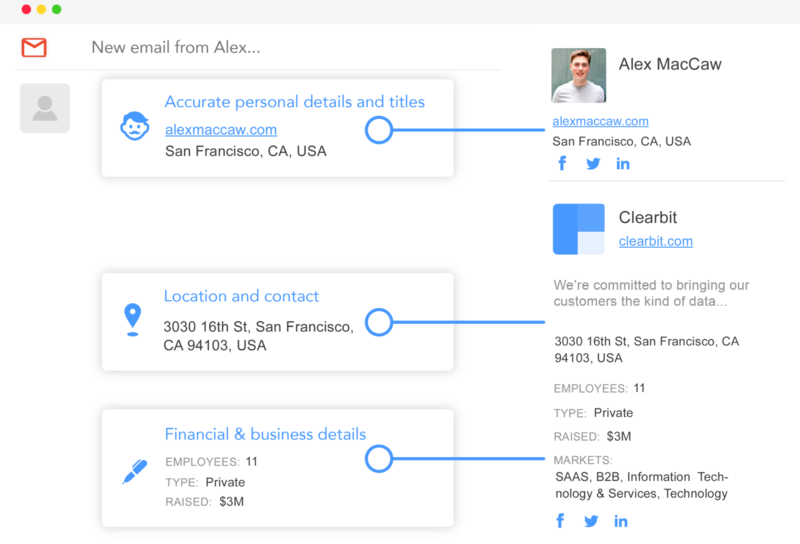 Clearbit Connect, for example, is a free Gmail extension that enriches email addresses inside of Gmail. It brings the value of Clearbit’s core product straight to a user’s Gmail inbox—no complicated code required. And the company keeps working on creating more value for free. Last November they shipped their most requested feature: integrating Clearbit Connect with Google Inbox. They keep iterating and improving a free product because it’s a frictionless way to get their product in front of a lot of users—70,000 users a day, to be exact. Integrating Connect with Inbox gives more people a chance to try it out and creates more opportunity for users to upgrade to a paid plan or recommend the product to others. Either way, it’s win-win for Clearbit. Make it as easy as possible for users to get started. If you’re building an API-first product, but your end-users aren’t developers, give people a variety of ways to interface with your product. Marketers and salespeople won’t read through API documents or lines of code to try your free product—so don’t make them. Open-source tools. If your audience is developers, they’re probably on Github. Creating open-source tools is a great opportunity to put your product in front of them and encourage them to try it out. Keen.io is really successful with this. They’ve open-sourced dashboard themes for Bootstrap, a data explorer, a tool for building cohorts, and more. Clearbit’s products require a developer, but are used (and purchased) by sales and marketing. Building free products that easily hook in the target buying audience makes them more likely to buy your main product down the road. The strategies above work well when your core customers aren’t developers, but your product might require their support. But what do you do if your core customers are developers? You’ll want to think about user growth a little bit differently. If you’ve built a highly technical product for developers, a good way to spread your product is to get developers to tell their friends about you. Stripe does a great job of this. The company’s big-picture goal is to increase the GDP of the internet—and it’s achieving this by making it really easy for companies to accept payments online. Stripe’s landing page shows developers a snippet of code that they can use to get up and running with payments in minutes. It might take a day for a developer to integrate a gateway to PayPal, or weeks to cobble together their own payments functionality. 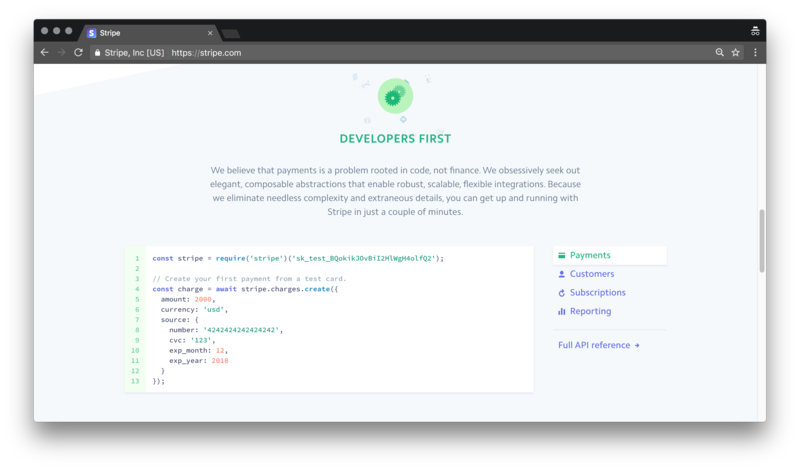 With Stripe’s easy-to-use and well-documented API, developers could get payments running in a matter of minutes. Help your audience to get their attention. If your audience is developers, figure out where they hang out and how you can reach them. For example, they may spend time on sites where they can read about other products or learn more about writing code. Create resources that they can find there and point them back to your product. Sendgrid, an email delivery service, does this well—they’ve created two courses on Codecademy showing people how to use the product’s API. Create new products and functionality. Stripe is constantly releasing new products that extend the functionality of its payments platform. This creates more reasons for a user to turn to Stripe and attracts a wider audience. It also increases the depth of usage for current customers because they can accomplish more with the suite of products. For example, Stripe has built out Stripe Radar, a fraud prevention toolkit. Meanwhile, Stripe Sigma provides developers with business analytics around payments. Stripe succeeded because it knew its customer inside and out. To grow an invisible product, you have to understand who your core customer is and build your strategy around exactly what they want to do. Does your sign-up process require a lot of hands-on support? Do your best leads get stalled because they need approval from other teams—or even the whole company—before they can buy in? Does your product have a million use cases and a million potential customers, and you just haven’t figured out how to communicate with them? You can resolve each of these questions and start generating growth once you start thinking about how you can best communicate your core value. Connect what your product does with what your user wants to do. Then, communicate it and make it really easy for new users to get started. The way you do this with an invisible product isn’t that different from how you would a visible one. You can use content to build SEO, give away tools for free, or build a product that’s easy to use and easy to share. These strategies won’t always go “viral” and they almost always take hard work. But they help connect your product’s core value with your user’s goals. This is how you ultimately make an invisible product visible.